Does team conflict and communication breakdown frustrate how your company grows? Well, you’re not alone. Business owners, project managers, workforce development executives & executive directors have felt the impact of the economy’s downturn. In hard times companies have to face downsizing, layoffs & uncertain futures, but additionally they are faced with festering forms of conflict and the breakdown of communication & poor cooperation in the workplace. So what happens when times get tough? Companies without a strong team culture waffle under course corrections that frustrate employee cooperation. Business leaders begin to scrutinize their employees to determine who is expendable, employees expect more from their bosses, and talented employees are not achieving the professional success and validation they crave. As a result, business growth, employee moral & working relationships all suffer. Now, more than ever, employees need to be in sync with companies’ values and goals. For businesses clearly intending to survive the weak economy, now is the time to prepare for the better times ahead. How? By building and improving your work team communications and stopping the root causes of team conflict now before you are too busy and these issues frustrate your growth progress. This is where TIGERS Success Series can give you the solutions you need. 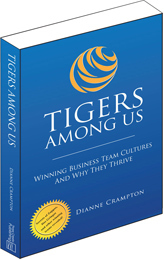 Dianne Crampton, of TIGERS Success Series, has been helping companies and leaders for 20 years. Some of these leaders are now known as the best in the country! Dianne has formulated a program based on your needs, to help you grow, succeed, achieve, and overcome team cooperation, conflict and miscommunication obstacles. Dianne is a professional of organizational change and development, and she can substantially impact your team culture, leadership & team building dynamic. Now, imagine having the freedom to grow your business to new heights! Imagine – a simple, common-sense system that demystifies how to build a WINNING TEAM culture that is easy to implement and builds company-wide confidence while reinforcing your existing vision and values. A system that helps you build a company culture that values excellent working relationships. And, YOU can easily learn this simple system. It’s the fastest, easiest, most cost-effective way to unravel team problems so you have the freedom and support to take your business to the next level. Best of all, Dianne is presenting a complimentary teleseminar where she presents four tips from her BRAND-NEW teleclass "5 Common Sense Steps For Guiding Teams Out Of Conflict And Confusion” on Thursday, December 30, 1:00-2:10 PM Pacific Time, 2:00-3:10 Mountain, 3:00-4:10 Central and 4:00-5:10 Eastern. Let Dianne walk you through her common sense approach to creating a cooperative and synergistic team that is capable of dealing with misunderstanding before they become full blown conflict. You want to recruit and retain the best employees in the field. You’re committed to uncovering the root cause of what’s causing conflict and confusion for your team and resolving it once and for all so you can get on with growing your company with loyal and accountable employees. You have an excellent product or service that you want to bring into the world in a big way! Over the past 20 years Dianne Crampton, of TIGERS Success Series, has helped leaders build teams of employees who love their companies as much as they do. Some of these leaders are now known as the best in the country! She is known as North America's Leading Authorities on Team Culture.